KNOXVILLE, TN — The Sunday after over 1700 citizens of Knoxville spent two days in front of the school board upset over the planned defunding of Project Grad and magnet schools serving the inner city; citizens from all parts of Knoxville gathered in deep west Knoxville. Many of the concerned came from all parts of Knoxville, some driving over twenty minutes across town, despite a soggy rainy day to unite with a unique plan. 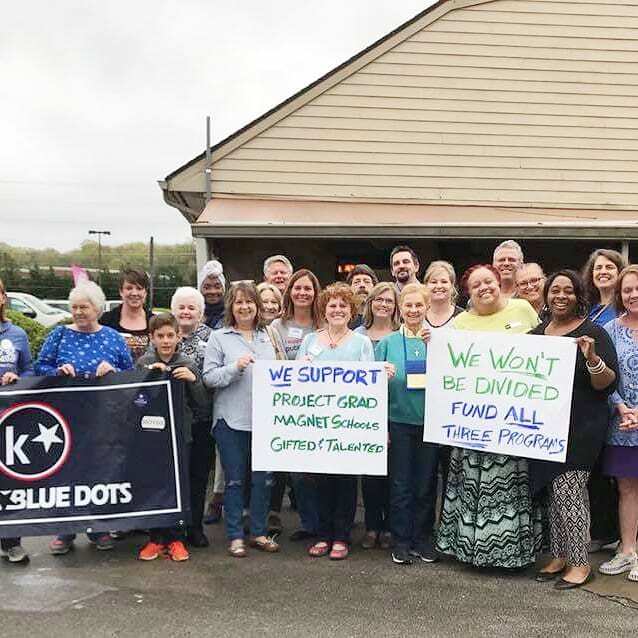 Working in partnership with the organization The Knoxville Blue Dots, the citizens filled Ochulas restaurant as they held a post card writing campaign. Over 100 messages of support for the programs were hand written to each school board member and county commission requesting they find money to keep the two programs, along with the gifted and talented program intact. The crowd was diverse. All races and different ethnic groups, students, candidates, parents, even people with no children who know the value of the programs; gathered in unity to stand for Grad. Even as the cards were mailed that evening, the next project, a letter writing campaign by the children from all schools affected by the potential cuts, went into planning mode under the direction of Coleen Martinez. The children will gather on Sunday the 22nd from the affected schools to write their personal messages and mail them in time to reach each Board member the week before the vote. Children and their parents will also be asked to attend and sit on the front rows on April 30th to bear witness to their fate as the board makes the final vote on whether to continue funding of the programs.